What can a sparkling water company teach us about social media marketing? As it turns out, a lot. 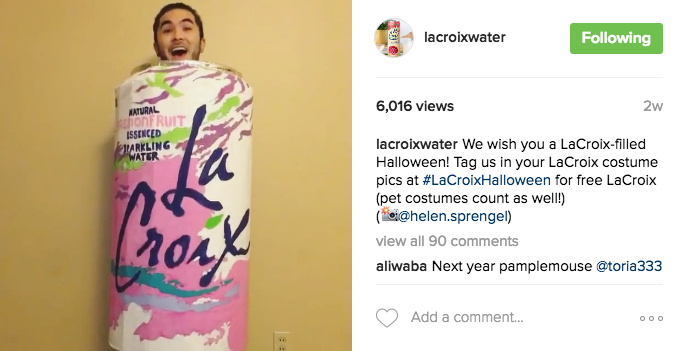 I recently participated in the #LaCroixHalloween Instagram promotion and I am sharing what I learned from their social media marketing strategy. LaCroix is enjoying a renaissance, visible in grocery store displays and fridges across America. Many of us have traded one addiction (Coke Zero) for another: expensive fizzy flavored water. As I type this, I am sipping on an orange LaCroix (one of the many I consumed to produce the costume pictured above). It is no secret that people who drink LaCroix are obsessed with LaCroix. 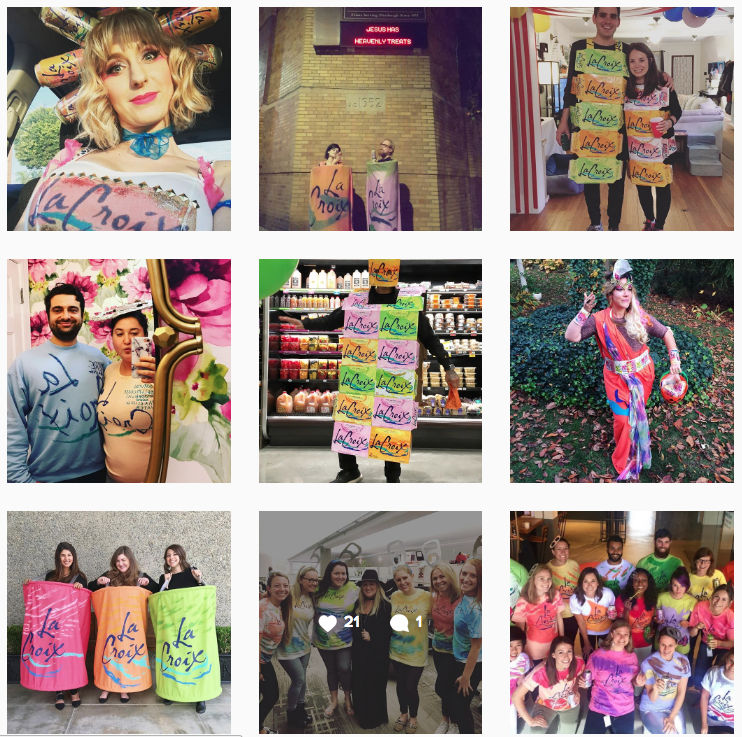 To capitalize on their loyal fan base, LaCroix ran a Halloween campaign on their Instagram using the hashtag #LaCroixHalloween. I was thoroughly impressed with their strategy and execution for a number of reasons. Read along as I break down how LaCroix hit it out of the park – and how you can build an effective social media contest for your own business. LaCroix smartly piggybacked on the already Instagramable Halloween holiday. When you run a social contest or promotion, you want to tie into a season, activity, or holiday that is already actively engaging your target audience. If your audience cares about at least one element of your contest, they are much more likely to participate. #LaCroixHalloween is a wonderful example of a social media contest that builds on the excitement of an existing holiday. The hashtag is relevant and does not scream “promotion,” which was a selling point for me. I do not like participating in photo contests that seem unnatural for my Instagram profile. This contest fit into what I was already planning to post and the hashtag didn’t “give me away” as someone trying to score free LaCroix… Even though that was totally my goal once I learned about the contest. As you can see in the comments in the photo above, two followers are already planning their costumes for next year. User-generated content is the secret weapon of your digital marketing strategy. It just doesn’t get better than your target audience creating brand-related content for your company. 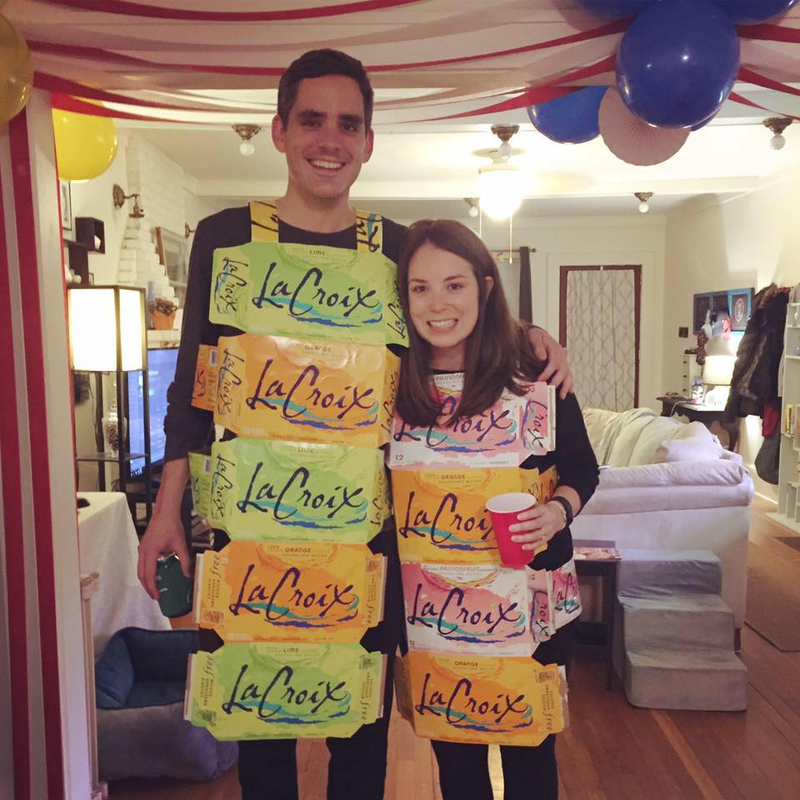 LaCroix’s contest encouraged fans of the brand to post pictures of themselves dressed up as their preferred sparkling water. These images are pure marketing gold. They say that you’ve truly made it when you have a Halloween costume in your likeness. Furthermore, LaCroix contacted the #LaCroixHalloween posters and asked them to sign an agreement so that LaCroix could share their images. LaCroix then posted some of the best costumes on their Instagram. This is a digital marketing home run. If you have a product or service that people would dress up as, take note. It doesn’t have to be your business specifically, it can be related. Say you are a yoga teacher… You can encourage people who are dressing up as yoga teachers or yoginis to share their costume using your hashtag. This is pretty obvious, but LaCroix ran the contest where their audience already posts pictures. Snapping a picture of yourself in your Halloween costume is a no brainer. In this way, the contest took advantage of the Instagram platform and used it to its advantage. In my experience, photo contests perform better on Instagram rather than on Facebook or Twitter. This is because sharing pictures is the native purpose of Instagram. For Facebook, I find that liking and commenting are ideal for contest engagement. As with anything, you should AB test and experiment. What works for one business and one industry is different than another (duh!). In general, you should keep it as simple as possible and offer a valuable giveaway or enticing coupon. #LaCroixHalloween was especially successful because of the responsive social media team managing the company Instagram. I posted my LaCroix costume to Instagram before hearing about the contest. A member of the LaCroix social media team direct messaged me and encouraged me to participate. 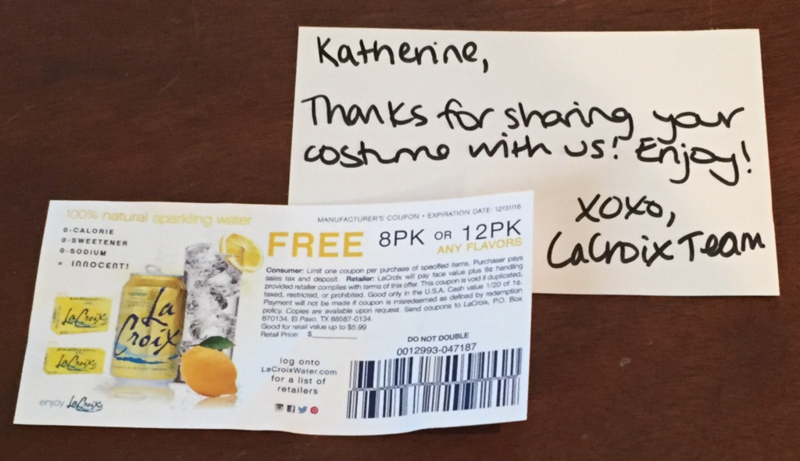 In their social media promotion, LaCroix Water embraced their company and brand culture. It is no secret that LaCroix-lovers are nuts. This contest played into that and made it fun! Keeping the contest light and easy encourages participation and creates a positive experience. Before launching your own social media promotion, consider what makes your business unique. What is your brand attitude? How does your company culture shine on social media? The best advice I can give is to create a contest that is a natural fit for your business and that engages your target audience by delivering value. If you want to discuss what this looks like for your specific brand, email me at katherine@upperlimitsdigital.com.